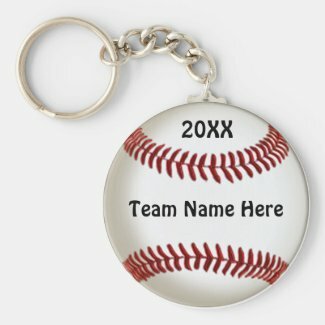 Cheap Personalized Baseball Gifts for Kids with the TEAM NAME and YEAR. The second Cheap Baseball Keychain has the Player’s NAME and his Jersey NUMBER. Personalized Baseball Gifts for Teenagers and Kids makes it even more fun and special. They will have a memory for their great year playing ball. These will make nice baseball grab bag gifts too. 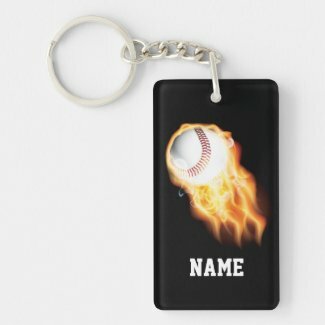 If you prefer you can go see ALL Personalized Baseball Gifts for Players, Coaches, Moms and Teams at my Zazzle Baseball Stuff Category CLICK HERE. 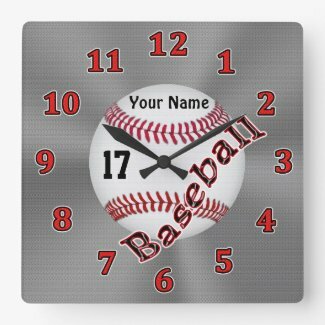 They will really enjoy these cool Personalized Baseball Wall Clocks with TEAM NAME, Players NAME or and His Jersey NUMBER or Monogram typed into the Two simple to use Text Box Templates. The background is a customized Silver Gray Burnished look. 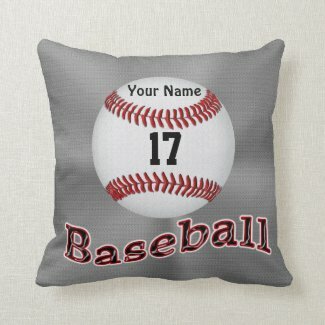 Be sure to look at both sides of the Personalized Baseball Pillows too. Buy with complete confidence with Better Business Bureau A+ Rating and 100% Guarantee that if you don’t LOVE IT, you can return it. Less than a 1% Return Rate is incredible. I create the designs for these gifts and Zazzle does the rest with their incredible robot printing machines on quality products. Here are two examples of the designs I created, where you can Type in the Year and Team Name or how about their Jersey Number (or Monogram) and their Name. When you are purchasing multiple personalized gifts for the baseball team, be sure to Personalize EACH GIFT SEPARATELY, then “Add to Cart” and Go Back to customize the next personalized baseball gift. DELETE any text you wish to eliminate altogether. 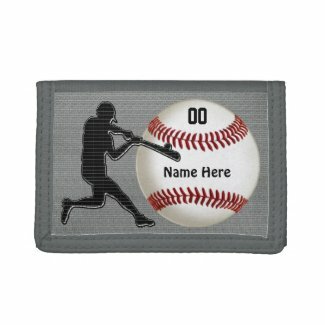 More Personalized Baseball Gifts for Kids Personalized just for the Baseball Players. Great End of Season Gift Ideas for Baseball Players or type in the Coach’s NAME. 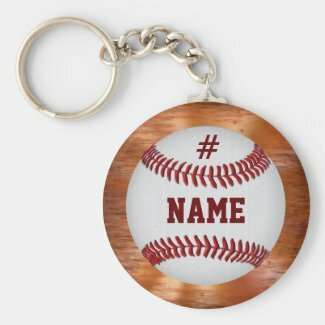 Choose from several baseball keychain styles from under $5.00 to over $20.00. Look to your lower right side of the gifts under “Style Options” to choose a different style baseball Keychain. These make great Baseball Team Gifts, because they are available in so many styles to fit everyone’s budget. Personalize ONE at a Time. Bulk discounts are available on most Zazzle personalized gifts. Thank you for shopping with Little Linda Pinda Designs, I really appreciate it. I aim to please so if you would like me to customize any gifts for you or make any changes to any of my designs, please call me at 239-949-9090. I can also put any of my designs on any Zazzle gift. I love giving my family Zazzle gifts because of the quality, the amazing detailed and vibrant printing and the great customer service. This is why they earned an A+ Rating from the Better Business Bureau See Zazzle’s A+ Rating. You will love this YouTube Video owned by the Major League Baseball organization. See amazing, funny and how did they do that catches. See what fans are willing to do to catch a foul ball. Wow. On average, there are 49.2 Foul Balls per game and most catches by the fans are not recorded on video but the Baseball Major League found these to be worth replaying, over and over again. More than 100,000 Views and 224 Likes as of today. Do you think this is real or not? Take a close look. If it is real then it is an amazing catch by ball girl. If it is fake then it is edited really good. Whatever it is, it is fun to watch. Please don’t read the comments as there are some using very bad language. Baseball Stuff and more Custom and Personalized Baseball Gifts for Men, Women, Boys, Girls and Babies.